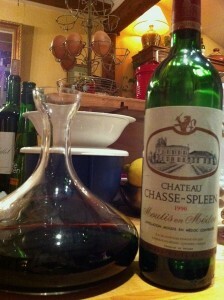 Here we are, almost one quarter century later, and I opened a lovely bottle of Château Chasse Spleen, a well-known Medoc from the Moulis appellation. The vintage is 1990, a hot vintage that has aged well over the years. When those wines were released en primeur, as futures, prices were not nearly as mad as they are these days. A first growth, Lafite or Latour, would have cost at most $75 per bottle (compared to recent prices approaching at least 10 times as much). Château Chasse Spleen is a more humble estate. There are clay soils as well, so a bit more Merlot than one would think from the Medoc. In any case, what a great wine for a special dinner with friends: mushroom soup (no cream) made from freshly picked, then dried, mushrooms followed by a Tandori like chicken, skins peeled but roasted with spices that were never too obtrusive for the wine. And what a wine! One hour in a carafe gave requisite air. Aromas of musk, truffle, graphite, underlying red fruit, pipe tobacco on the nose. The palate was well balanced. A register of 12.8 percent alcohol – above average for those days, but a far cry from the near 15 per cent we get today too often. The palate was rich and brisk at the same time, tamed tannin, but still very present in an accommodating fashion. Fine freshness, indeed the finish was marked by a pleasantly slightly bitter finish, very tonic, that invited one to have yet more. The bottle was emptied with much pleasure but not too much haste. There was complexity to appreciate, to savor, during the meal – and again afterwards. Château Chasse-Spleen is located in the Moulis-en-Médoc appellation, northwest of Margaux. It was selected as one of six Crus Exceptionnels in the Cru Bourgeois classification of 1932, and again – much later – in 2003. The estate is widely considered to be of cru classé standard, and that was proven again with this fine 1990.